Martha Boto, Dynamo, 1969. Metal, plastic, electric motor, 17 1/2 in. x 16 1/2 in. x 9 in. Martha Boto, Deplacements Optiques, 1968. Metal, Plexiglas, electric motor, 18 7/8 in. x 14 15/16 in. x 8 1/2 in. Born in Buenos Aires, Martha Boto was drawn to art as a young child, and her family supported her studies. 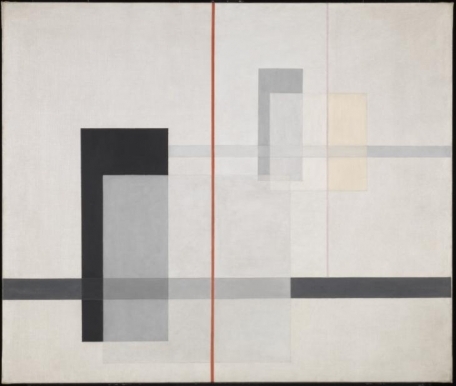 Between the end of the 1930s and the beginning of the 1940s, she joined the first abstract art movements in Buenos Aires, including the Asociación Arte Nuevo. In 1944, she attended the Escuela Superior de Bellas Artes “Ernesto de la Cárcova,” where she took classes in drawing and painting. 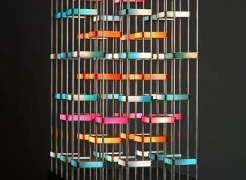 In the 1950s, Boto showed her work at several Buenos Aires galleries, including Van Riel and Galatea y H. She began to create structures and transparent mobiles in Plexiglas, with colored water, perhaps in dialogue with works being made around the same time by Gyula Kosice. In 1956, she (along with Gregorio Vardanega), co-founded the group Artistas No Figurativos de la Argentina. In 1959, Boto and Vardanega moved to Paris, and she began a new phase of her career. In 1960, she participated in the first Bienal of Paris and she began to explore movement in sculpture. She developed her kinetic works during this time, adding a motor, or colored lights, to her sculptural practice, and focusing upon the effects of movement, illumination, and color; of especial interest was the ability to modify, absorb, and reflect light. To this end, she also began experimenting with different industrial materials, including aluminum and stainless steel. In 1961, she showed her works for the first time at the Denise René Gallery, in the group exhibition Art abstrait constructif international. Art critics of the time described her works in relation to the genre of science fiction, and with the seeming magic of space travel. Her first solo exhibition at Denise René was in 1969. Boto continued to work, making sculptures and paintings, through the early 2000s. Her works have been included in numerous important exhibitions, including most recently, Real/Virtual, Arte Cinético Argentino de los Años Sesenta, at the Museo Nacional de Bellas Artes, Buenos Aires, Argentina and Lo[s] Cinetico[s] at the Museo Nacional Centro de Arte Reina Sofía, Madrid, Spain. She died in Paris in 2004.